Ralph J. Blauvelt is a composer and musician who lives with his wife, Frances Riley Blauvelt, in Spring Valley. He has published two books about his music, two LP albums, and seventeen CDs of his music. From 1994 to 2004 he was the genealogist for the Association of Blauvelt Descendants and has written numerous articles soon to be published in book form, entitled A Blauvelt Descendant: Researching Family History. A version of this article was first published in Fall 2007 issue of The Blauvelt News. 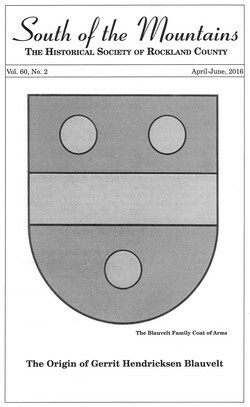 COVER PICTURE: The Blauvelt Family Coat of Arms. In color, it has three gold discs and a gold bar on a blue field. From the Collection of Ralph J. Blauvelt. © 2016 The Historical Society of Rockland County.